It is not too bold a statement to say that Robert Trent Jones created the profession of golf course architecture as we know it today. He famously designed his own curriculum at Cornell that encompassed all of the elements that he thought would be required for his success, in the breadth of his studies displaying the creativity and vision that would mark his entire career. 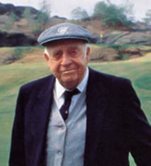 After an eight-year partnership with Stanley Thompson, Jones struck out on his own, and within a few years was the best-known course architect. So innovative were his ideas and designs that he changed the world of golf in the post-War years, spawning imitators and critics alike as he revolutionized the game. His designs featured a strategic philosophy that rewarded brave shots that were well executed and punished poor ones, but which offered the player looking to avoid risk a safer alternative. To the dismay of many professionals that were used to easier courses, Jones was not afraid to challenge their abilities. They learned that they couldn’t overpower a Trent Jones course. While his original works first brought him attention, his work as “the Open doctor,” upgrading courses for that championship, also added to his reputation. Ben Hogan’s final round 67 at Oakland Hills in 1951 on the revamped Jones layout is considered by many one of the greatest rounds ever played, the champion surviving the ultimate test of golf. Jones delighted in making those tests harder as the skill of the players and the quality of the equipment improved. 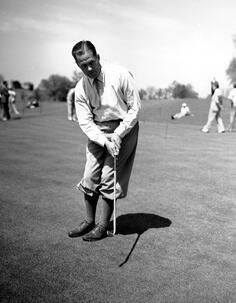 He created or redid more than six hundred courses, and his work had a global reach that was unmatched. He first came to the shores of Hazeltine Lake in 1959, and laid out the original course which opened three years later. He redesigned a number of holes in the twenty years that followed. 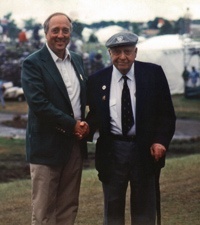 In advance of the 1991 U.S. Open, Rees Jones, the son of Robert Trent Jones, succeeded his father as the architect charged with keeping Hazeltine qualified as a true test of major championship golf. Rees had years of experience of working with his father, from charting the shots of professionals during Open championships as a boy to heading the East Coast office of Robert Trent Jones, Inc. for ten years. In 1974, he started his own design firm. He developed a style that blended the strategic philosophy and innovation of his father with the classic themes of the traditional courses that were inspired by old Scottish links. He also became a leader in the creation of designs that are environmentally friendly, demonstrating that golf courses are often preferred in sensitive areas when compared to other uses, as demonstrated by such original designs as Atlantic Golf Club and Nantucket Golf Club. Due to his work on The Country Club for the 1988 Open and Hazeltine for the 1991 Open, Rees Jones inherited Robert Trent Jones’ title of “the Open doctor.” His many upgrades of courses in advance of major championships also include the critically-acclaimed redesign of Bethpage Black in advance of the 2002 Open won by Tiger Woods. At Hazeltine, Rees has upgraded his father’s basic routing by adding tees, adjusting fairways, and repositioning bunkers to maintain the demanding shot values of years before. The result is a golf course that continues to provide a challenge for professionals and members alike. The work of the father and the work of the son blend seamlessly to offer a test that has been honed over time.